A rounded shrub with dark green leaves. 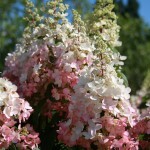 The large panicles of white flowers age to darker pink in mid-summer, giving each flower a two-tone look. Strong stiff branches hold the flowers well. 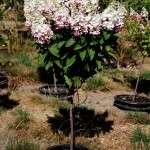 Grown tree form and shrub form. 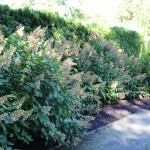 It prefers full sun to some shade and a moist, well-drained soil. 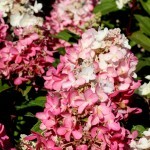 Useful in a shrub border, in a container, and for fresh or dried flowers. PP 16,166.